I used to buy pancake syrup all the time - usually the large 2 pack of Mrs. Butterworth's from Sam's club. When the kids were at home, we went through quite a bit of that. I made a lot of waffles. Nowadays I'm (usually) avoiding buying anything that contains high fructose corn syrup, so I've started making my own syrup. Seriously, it's really easy, and it tastes just as good. It's probably cheaper, too. It's really just sugar and water with some maple flavoring, so I'm not claiming it's actually healthy, but there is definitely no high fructose corn syrup. 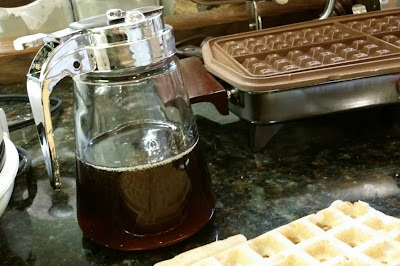 I'm sure some real maple syrup would be better - but this is good if you don't have any of that. Remove from heat and stir in flavoring. Serve warm. Or cold. Refrigerate any leftovers. It's even better if you find one of these cute syrup dispensers to put your syrup in. We picked one up recently, and I love it. 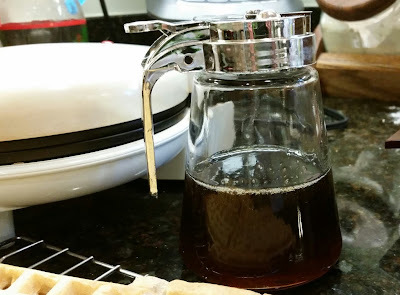 My mom always used to make our syrup when I was growing up. I never thought to ask her about her recipe.